ControlOMatic develops and manufactures saltwater chlorinators for the pool and spa industry throughout the world. For the last 30 years, saltwater pools have been in high demand due to improved water quality and the huge reduction in maintenance that a saltwater system provides. Until now, a smaller saltwater system designed for a spa or hot tub was not an option. The standard spa chlorine generators offered by ControlOMatic are very easy to install and do not require the spa to even be on or interfere with the current plumbing or electronics, simply add salt, place in the water, and turn it on. The ChlorMaker, SmarterSpa and MegaChlor are saltwater systems uniquely designed for hot tubs and spas bringing the same water quality and maintenance reduction benefits that pool owners have enjoyed for years. Simply turn the water in your hot tub into saltwater by adding salt (about a teaspoon per gallon), and then let our chlorine generator take care of your sanitation needs day after day. The salt requirements for our saltwater systems is very low, between 1,500 and 2,000 PPM, less than 6% of the salt concentration of the ocean, you most likely will not be able to taste the salt. Chlorine generation from salt water has been around for a very long time and is very popular for swimming pools since the early 1970s. ControlOMatic introduced the first chlorine generator specifically designed for spas and hot tubs back in 2005, the first model was called the ColorChlor, in addition to making chlorine it also provided lights which worked well for older spas. The SmarterSpa is the only spa and hot tub saltwater chlorine generator with built-in chlorine detection in existence. It turns on when needed instead of a timed cycle. It doesn’t need a vacation mode or temperature compensation to try and limit chlorine production, it just turns on when needed. In fact, if you don’t set it up properly, that doesn’t really matter – it will still turn on when needed. 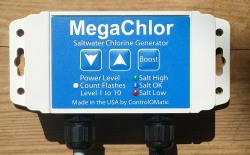 The ChlorMaker includes 10 power levels, salt level indication, external control box, boost mode and automatic cleaning. Easy to use buttons and LED’s for status. ControlOMatic’s first large saltwater system for pools. The MegaChlor makes about 0.25 pounds of chlorine per day and is available as a plug-n-play drape over version for pools and swim spas up to 17,000 gallons. The CD option replaces the standard electrode with the chlorine detection version. The MegaChlor-CD will start the next production cycle when the chlorine is low enough. Chemical Automation refers to the automatic monitoring and control of the sanitizer and pH levels in water, in order to maintain clean, safe water at all times, while achieving significant reductions in the cost of chemicals, maintenance and repairs. Chemical automation is now recognized as a necessity for all commercial and public pools and spas, as well as for quality residential installations. ControlOMatic systems offer the most advanced line of electronic controllers for monitoring and control of water chemistry. For complete details please visit our PoolWarden website.